The pieces in the Furniture Gallery are original designs, period reproductions or were built to the specific needs of a client, so think of the dimensions as a rough idea of the scale. If you require a hall table slightly narrower than shown or your coffee table must have a drawer, that is what I will make for you. Quarter-sawn White Oak is the wood species favored by the original Arts & Crafts furniture makers, both for it's durability and it's beauty, and I primarily use that same material. 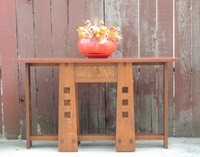 In the Gallery there are also examples made in cherry, mahogany, and walnut. All designs are available in the species of your choice. Construction All of my furniture is built using the same methods employed by the arts and crafts artisans of the early 20th century. 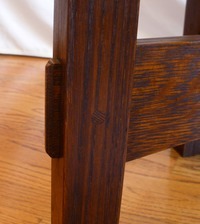 The joints are true mortise and tenon, through tenons are pinned with dowels, solid wood is used throughout. Great efforts are made in lumber selection, the best boards are used for tops, chair arms, and other highly visible areas. The drawer fronts on a dresser are made from matching boards, preferably from the same tree. If the width and quality of lumber is not available I wait until it becomes available. This furniture is built to last a lifetime so it must be of a quality worthy of the test of time. Finish My standard finish is custom mixed aniline dye with a top coat of shellac and finally a hand rubbed coat of high quality pigmented furniture wax. This combination, along with being historically accurate, gives the furniture a warm look and feel. I have a few standard finish colors to choose from or a custom match can be made for a fee. For a more durable finish I also offer a water based poly-acrylic, a good idea for dining table tops or any high wear surfaces. Pricing Because of the custom nature of most of my furniture, prices are available upon request. Keep in mind that multiples will cost less per unit than single pieces. Two night stands or six side chairs will be less per unit each than a single piece. Shipping is available throughout the U.S..